Our fantastic Cherry Blossom Shoji Sliding Door Kit comes with sliding doors, top and bottom tracks, and right and left door jambs. 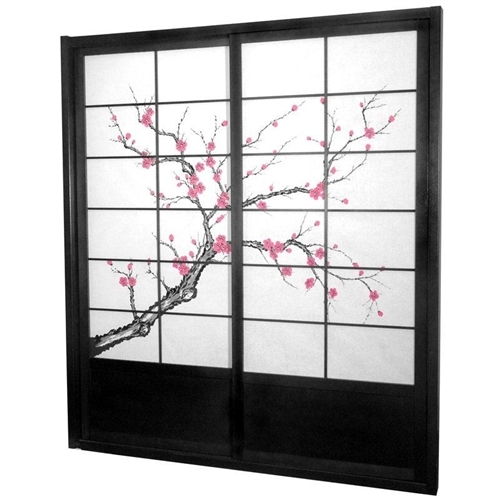 The Cherry Blossom Shoji Screen has long been one of our best-sellers and we decided to introduce this beautiful new sliding door version. It's available in two colors and is an elegant and subtle way of bringing an Asian flair to your space. Available in two fine wood finishes (see thumbnails). Finished frame with intricate lattice design on one side only (see last picture for backside). NOTE: If you prefer no bottom track, install sliding door hardware (top mounted) from your local hardware retailer.